Good cell service is hard to come by, especially in NYC, but five bars won't do much good when you're DEAD. Some New Yorkers are convinced that the AT&T and T-Mo antennas on their roof are bringing the building down. 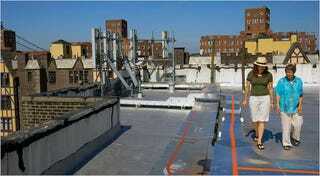 The tenants of 165 Pinehurst Avenue in New York City have a dilemma: they have perfect cell service, thanks to the two T-Mobile and AT&T cellular base stations and 20 antennas installed on their roof, but they'd been told by the building's owner, who receives compensation for housing the antennas, that the roof could not support a single human's body weight. Uh oh! Long, zigzagging cracks have appeared along the building's outer walls, and mortar has crumbled from the parapet, which supports hefty I-beams upon which the base stations sit. AT&T and T-Mo said that the installations were safe and in accordance with building codes, though the city's Buildings Department slapped the landlord with a violation after a city engineer found "four large cracks beneath the base station's support beams." Several tenants are suing the landlord for installing the base stations in the first place.